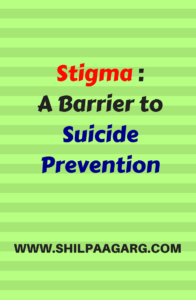 Stigma : A Barrier to Suicide Prevention - A Rose Is A Rose Is A Rose! The person must be so sad and unhappy from life and its circumstances that ending his/her life is the only solution or escape in front of him/her. The loss of a loved one to a suicide would be so devastating for the family and friends. Thoughts that they could have prevented it, can be a living nightmare, a life ridden with guilt and fighting every day inner turmoil. While there would be many who would kill themselves on an impulse but most would be thinking and mulling over it for a long time. These are the warning signs which are hard to miss but are generally ignored. Why? Just as a blockage in artery can lead to a heart disease or an overgrowth of cells can cause a tumour or breakdown of the stomach lining can cause acidity or ulcer, similarly an imbalance in brain or its chemicals could lead to mental illnesses. While we waste no time to see a medical practitioner for any body ailment why do we hesitate to seek medical help when we suffer from psychological pain? Is it that we attach stigma to mental illnesses? Why do we have negative attitudes about individuals with mental illnesses and/or suicidal ideation or impulses? Attaching stigma to mental illness prevent people from seeking treatment, which in turn exposes them to a greater risk of suicide. Also suicide can appear to be the best solution for a stigmatised individual. A significant number of those with mental illnesses who commit suicide do not seek medical or professional health. Many people believe that if a person is going to kill themselves, there’s nothing one can do. If you try to stop them, they’ll just bide their time and do it later. However, data shows that suicidal intention is transient. If one can get support and medical assistance to get through the trying times, we can help prevent an untimely death and help someone to smile and live life once again. But, unless this stigma towards mental illnesses is confronted and challenged, it will continue to be a major barrier to the treatment of mental illnesses and to the prevention of suicide. World Suicide Prevention Day is an ideal time to inspire people to work towards the goal of developing creative new methods for eradicating stigma. And the first step towards is by creating awareness… let’s spread the word and do our bit in saving lives around us. We are blogging for this cause at Write Tribe. Do read and spread the awareness about this initiative. Human beings have a very strong survival instinct and they can live through difficult/depressing situations. Parents and society have an important task by building a solid foundation for their kids, in order to prevent suicide. One thing that many parents do (that may inadvertently misfire) is teaching their children that the world is a wonderful place and they can always be happy. False expectations is often a cause for suicide. Hence, building strength in kids by exposing them little by little to the truth, from an early age is critical (IMO). To add to our woes, our movies unnecessarily depict suicide as an option. People should shun such movies and drive them out of box office. Children killing themselves is so very heart breaking. Agree, as parents we have a big responsibility of nurturing and guiding them such that they are able to face the life and its battles bravely! You have stated all the facts. Yes, consulting a psychiatrist in India is like getting into an asylum. People around you stigmatize you to the extent that instead of getting better, you end up being forced into the dark dungeons. A person suffering from depression or having a tendency to commit suicide, needs just a listening ear. An NGO, for which a close friend was a volunteer is Sumaitri (http://sumaitri.net/). They are really doing a great job by providing communication channels to the affected ones. Most of the times, it takes just a minute or a few seconds to distract someone from the thought. True, even mentioning about a visit to a counselor or a psychiatrist means that you are ‘mad’. Such is the stigma about mental illness. Glad that we have NGOs like Sumaitri. May their tribe increase. As it has been proven that suicidal thoughts are usually transient, so a listening ear and the right support can help in changing the outlook. Amen to that… nobody should think about suicide! Agree! We need to do away with the stigma attached to mental illness. More people should read this you know. Yes, spreading awareness about mental illness and their treatment should be the mantra! Thanks Shilpa for sharing all the facts about suicide. I believe we can stop someone from committing suicide by giving our support, love and care. This should be followed by medical assistance and constant touch with the person. Informative post !! consulting a psychiatrist in India is like getting into an asylum., as Rekha has mentioned above is true. The family member would dump the affected person and tell the society that he/she is missing or lost. Such is the stigma attached to mental illness. The certains symptoms of a person having suicidal tendencies should not be ignored. And that is such a sad situation! Hope awareness about mental illness is increased and stigma attached to it is eradicated completely! One hears of most suicides have been a result if failures..be it in love,be it in exams.Failures are very difficult to digest. Napolean Hill said, before success comes in any man’s life, he’s sure to meet with much temporary defeat and, perhaps some failures. When defeat overtakes a man, the easiest and the most logical thing to do is to quit. That’s exactly what the majority of men do. And that is such a wrong thing to do! Absolutely! Professional help and a comforting ear can do wonders! Very well presented, Shilpa. Like you said, 100% preventable – let’s do all we can. Am so glad to be a part of this campaign this year, Corinne. Thanks for sharing about it! That’s a very educating post. But a lot of awareness is required to make people understand the symptoms of a person with suicidal tendencies, so that they can seek help. True, awareness needs to be raised, as there’s so much of stigma attached to mental illnesses. A very thought provoking and educative post. Counselling sessions can be held in schools/colleges. It is at this stage that suicidal tendencies become very strong. behavior modification to interpersonal oriented approaches. Hope this becomes a norm in all institutions. Are there suicide prevention hotlines in India? The crisis counselors (volunteering in those centers) can comfort them. It is the mind set that can make us take a dip or walk a mile in our life! Yes, our life is what our thoughts make it. If everyone could just talk about their feelings atleast to one… some might have been still alive even now. Well said, Sheethal. Sometimes it’s easy to feel like you’re the only one in the world who’s struggling, who’s frustrated, or unsatisfied at barely getting by. But a little help sometimes, someone to help us hear the music in the world again is all that we need. Someone to remind us that it wont always be this way. I wish things could change more..
You are absolutely right, Richa! Too often we underestimate the power of a touch, a smile, a kind word, a listening ear, an honest compliment, or the smallest act of caring, all of which have the potential to turn a life around. Suicide is so sad and often no one realizes how desperately sad the person who dies is. If only they could be convinced that their life is worth saving, is worth seeing through to another day. Sad for everyone. True Kathy, suicide never only affects the person that committed it. It affects everyone and the person too. But many suicidal thoughts can be prevented if the warning signs are recognized and proper action is taken. Hi Shilpa, pertinent points raised on symptoms that a peron is suffering and the stigma that we attach owing to in born prejudices. It is a very informative post. Very thought provoking post Shilpa. If only people just learn to listen and stop treating anyone who admits to seeking help in such cases like outlaws, things will surely take a better turn… Sometimes just speaking out your mind without the fear of being judged lightens the heart and rejuvenates a sinking life. Absolutely. they say the most basic of all human needs is the need to understand and be understood. The best way to understand people is to listen to them. And this is something that we lack, sadly! Thanks for sharing about SAHAI, Mr Ayyangar. It is such a complex topic to comprehend. I guess being aware is the first step towards bringing down suicides. Oh yes! The first step toward change is awareness. Though the warning signs can be subtle, but they are there. By recognizing these signs, and where to turn for help, can certainly bring out the change and the power to save a life. True. I have seen, how talks of meeting a psychiatrist gets shocking or weird and looks of disbelief, even among ‘educated’ lot! Exactly, Sheela. Its all about our thoughts. Staying positive and getting help is the key! A very thoughtful post on suicide. Well researched too! 🙂 And yes, suicide is 100% preventable. Keep writing. Very informative post Shilpa. We really need to spread this awareness. To make people understand that all life, any life, is worth saving and savouring. Well said, Vaisakh. Yes, every life is precious and we must do our bit to spread awareness about suicide prevention! I don’t understand why we attach stigma to a disease. A person who is suffering already has his hands full – and then we look down upon what he has. What an amazing world we live in! My MIL is a patient of depression. She has had two attacks. The second time we were not told for 3-4 months. They told us when we went home for a visit. At first we did not know how to deal with it since we thought it was a phase. We tried to help her in various ways including Art of Living. Just before we were leaving, I told my husband that we should get counseling and looked for doctors near by. She was reluctant to go and kept repeating that she just wanted to die. But when she did, the doctor prescribed some medicines and she was fine in two days. Apparently some chemical composition in the head goes awry. It was that simple. Just because we refuse to share our illness with people, we don’t get a chance to correct it at the right time. Only if we were a more mature society. Thanks for sharing about your MIL, Nisha. I wonder when we will take mental illness just as any other illness of the body and seek medical help without any stigma attached to it! It is true we need to approach this issue in a matured way. Many times overly eager parents drive little children to suicide, even fights between couples can go out of control and lead to either one of them or both committing . We have cases of whole family consuming poison, mostly due to unmanagable situations in life. I feel at least we can make parents understand their children and not nag them regarding their studies, that seems to be most important in the present time. It is our unpreparedness to handle the battles of life push us to take such extreme steps. Wish we train and guide our children to have that survival instinct and prepare them to face the challenges of life too. 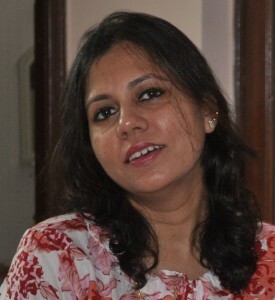 Hi Shilpa, nice to read your post, and agree with you 100 %. working in a psychological counseling centre, I find a lot of students do not come to our centre because of stigma attached to mental illness. when they decide to come, it is late and by then the problem becomes acute disorders, most of the time, students who have been suffering from fear and anxiety reach when they are almost getting a panic attack, or diagnosed as General Anxiety disorder. Some times it is too much of negative thinking with suicidal ideation, sometimes it is depression or at other times it is obsessive compulsive disorders or even mood disorders as you rightly mentioned. Which you spoken in detail. If we are able to identify any one of these clues, we can definitely reach out to them, by asking them directly or indirectly whether they are planning to attempt suicide, and appealing them to stay alive and assist them to take decisions. I have attempted to write this in my blog, sorry for this long comment, I felt enthusiastic in responding to you, and want you to know that I am with you in making a difference to those around, thanks for sharing ! Thanks a ton for sharing your practical experience, Genevive. You are doing such a noble work and helping our youngsters… You are truly making a difference. Proud of you! Quite informative and the need of the hour Shilpa…am glad many of you are writing for a great cause !!! We need all the awareness we can get about Suicide and depression. True, a child killing himself is so devastating! Well said Shilpa. Last year a man in our society committed suicide. I didn’t know him personally but I couldn’t help wondering whether if anyone, just anyone, would have stopped to talk to him even about something as mundane as the weather, while he took the lift up to the top floor, would he have reconsidered… It’s hard to imagine someone’s mindset as he sets out to end his life. I stumbled upon this article. It says blood test can detect suicidal tendency. We don’t look down on diabetics or heart patients. Why should we look down on persons having mental health issues? We don’t look down on a person having indigestion or a person having a broken arm. Why should we look down on a person having depression? You are right Shilpa, the stigma is a major issue. But of late things are improving. There is a section of society that understands that going to a mental illness professional does not mean having lost ones sanity. It could be a lot many other issues. Hopefully the awareness will spread with time. That’s true… people do visit hospitals and clinics for mental illness but a lot needs to be done still for creating awareness and eradicating stigma. Shilpa you have so kindly listed out the warning signs…I agree with you completely. Suicides are 100% preventable. Thank you for sharing your post for blog for a cause. It is my pleasure, Sugandha. Glad to blog for a cause and helping in spreading awareness about Suicide Prevention. Mental health issues are very common these days because of the increased stresses and the fast life we lead. Families need to support the person who is dealing with issues. Most times the person who is suffering feels so helpless that they take the drastic step of taking their life. A support group and suicide helplines are also a good way of helping people. Unfortunately there is a lack of awareness in our country…and most people don’t know where to go even when such facilities do exist. You are bang on, LP. Though there are a lot of helplines and NGOs who support in these trying times, but only if one connects with them. And for that to happen, awareness is so very crucial. My other once told me that there was some kind of noise about an great-aunt of hers having committed suicide. This would have been around 1900 or so. My mother could hardly say the word, and when she did, it was at a whisper. So sad. Thank you SO MUCH for bringing this topic out of the dark and speaking about suicide and mental illness on our blog, Shilpa.